Visual Learning Bridge teaches math concepts step-by-step with purposeful, sequential illustrations while connecting learning activities and lesson exercises. Grade 2 tear‑’n’‑take tablet contains workmat and recording space to support daily hands-on, interactive learning. Each Student Edition includes access to the Digital System for one year. 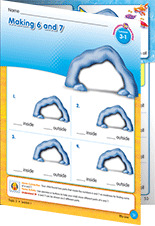 Student Lesson Packets provide a convenient alternative to the consumable tear‑’n’‑take Student Edition. Pre-folded 11" × 17" sheets form four-page booklets for each lesson include access to the Digital System for one year. Five to seven readers plus Guided Problem Solving Masters for each grade teach math concepts and real-world applications through literature. 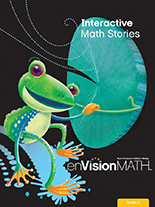 MathStart readers by Stuart J. Murphy enhance conceptual understanding through stories and a visual approach in Grades K–2. Kick off each topic with an Interactive Math Story that enhances students' understanding of math. Big Book format is perfect for reading in large and small groups. Teacher's Edition includes suggestions on how to involve students in the story through reading, gesturing, coloring, writing, and speaking. Each story is also animated on the Online Student Edition and is available in a take home format for students in the Teacher Resource Masters Pouches for each topic. 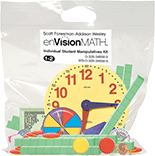 Includes magnetic board, 50 magnetic two-color counters, magnetic numbers, green powers of ten, and magnetic pattern blocks. For small- or large-group modeling of math concepts. Use in conjunction with Student Edition with Premium Digital System purchase. Includes ExamView® Assessment Suite Test Generator CD-ROM, MindPoint® QuizShow CD-ROM, and eTools Electronic Math Manipulatives CD-ROM; plus it backs up your online resources with the Student Edition CD‑ROM, Teacher’s Edition CD-ROM, and Digital Path Content DVD‑ROM. Digital Path Content DVD-ROM also includes Table of Contents, Visual Learning Animations, Quizzes with Leveled Homework, Video Topic Openers, Animated Interactive Math Stories (K–2), Printables, Guided Practice with embedded Tools4Math, Topic Games, Topic Songs (K–2), Print Partners and Keys, Computation Games, Tools4Math Workshops, and Enrichment Activities. Also includes Premium Digital System Teacher Online Access Pack and Premium Digital Implementation Guide. All CD-ROMs are also available separately. Use in conjunction with Student Edition with Digital System purchase. Includes Digital System Teacher Online Access Pack, Student Edition CD-ROM, Teacher Edition CD-ROM, Visual Learning Animations CD-ROM, Bilingual ExamView CD-ROM, MindPoint QuizShow CD-ROM, Topic Games CD-ROM, Topic Songs CD-ROM (K–2), and eTools CD-ROM. All CD‑ROMs are available separately. Engaging songs motivate while building understanding of concepts and mastery of skills. Windows: Minimum Processor: P4; Minimum System: Windows 2000/ME/XP; Memory: 256MB; CD/DVD Speed: 4X; Hard Drive Space: 30MB. Macintosh: Minimum Processor: G3; Minimum System: OS 10.3 (Classic mode required. Will not work on Intel based Macs); Memory: 128MB; CD/DVD Speed: 4X; Hard Drive Space: 30MB. Multiple-choice questions in a game-show format give your students additional math practice. Ideal for students to play on their own or in small groups, or you can create teams and get the whole class involved. Macintosh/Windows Dual Compatibility. 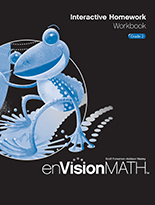 This enVisionMATH professional development DVD contains Modules and Conversations with enVisionMATH authors about key mathematics concepts in Grades K-2. In the Modules, authors use visuals and manipulatives to show how to develop these concepts with students. In the Conversations, authors discuss how to build conceptual understanding of these concepts in the classroom. 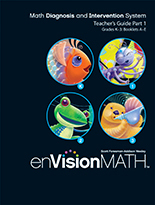 Consumable book containing all of the student lessons for transitioning to Common Core featured in the Transitioning to Common Core teacher resource kit available to all enVisionMATH users on SuccessNet.